Doxycycline is an antibiotic of the tetracycline group with a broad spectrum of action. Doxycycline hyclate is provided in solution to be administered orally. Such products traditionally present a series of problems of stability: forming coordination complexes (due to water hardness in case that it is used as an excipient), photo oxidation (as doxycycline becomes a quinone, responsible for discolouration), hydrolysis (basic pH more easily hydrolyzed) epimerization and precipitation. Once known all these possible form of degradation of doxycycline hyclate, deep galenic study is necessary to find a combination of solvents, stabilizers, pH buffers, etc … thereby offering the user a doxycycline hyclate solution which not present any of these possible reactions. Finally it has been found, by a combination series of galenic doxycycline hyclate technological factors in one solution that ensures product stability for two years. The product proves stability since there is no degradation in the concentration of the active ingredient. 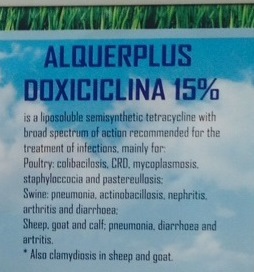 This product is commercially available under the name ALQUERPLUS Doxycycline.